Insects can store fat, though if an ant is chubby under its exoskeleton I doubt many would notice. More importantly, however, is that if an ant has extra calories, then she will share them with her nestmates! Ants have a social stomach or crop, which is a separate food-storage organ before their digestive stomach or midgut. When an ant feeds, she directs enough food to her midgut to meet her nutritional needs, and the rest to the crop. [I say "she," because all worker and soldier ants are females.] 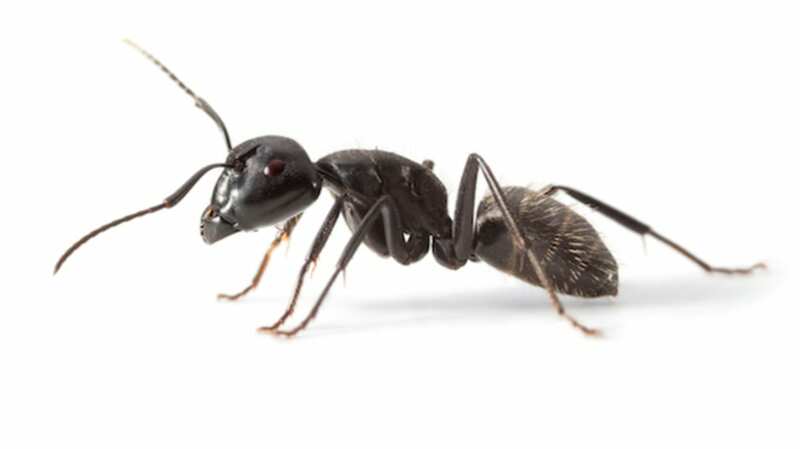 If she is hungry later she can move some to the midgut, but if another hungry ant passes her and taps her head with a special code using her antennae, saying "Feed me" in ant sign language, then the first ant will vomit out some stored food so the second can eat! Since ants have no refrigerators or other way to store food (unlike bees, which store nectar and honey in cells in the honeycomb), this is the best way to keep food, especially when traveling and burning calories like an ant on patrol. Some ants take it to an extreme: the honeypot ants have members called "repletes," whose crop expands to a huge size, several times larger than a regular ant. These ants become giant balls of nectar, storing calories for the entire colony, staying in the nest and not doing anything other than taking in and dispensing sugary liquids.